To request a member of the MBPC staff to speak at an event or participate in a panel, fill out this speaker request form. 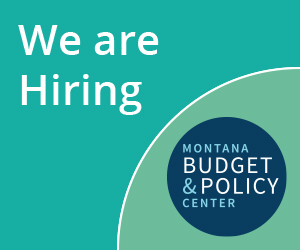 The Montana Budget and Policy Center strives to serve as a resource to members of the media by providing up to date, accurate policy analysis. To learn more about any of our research areas, or if you would like to speak to one of our policy analysts, please contact Tara Jensen, Co-Director of Public Affairs. For a full staff listing click here. MBPC’s work is not possible with out the generous support of donors. To contribute to our work, donate here. To receive our email updates, send us an email.